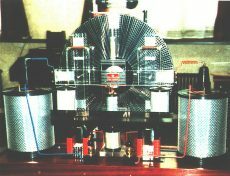 That the Swiss Methernitha group's Testatika machine is thought to be based on a Wimshurst electrostatic generator, is only a sparse approximation of the truth � of the great multitude of electrostatic influence machines developed around the 1900's it more closely follows the charge-separation-and-collection system used by the 1898 Pidgeon machine [note 1] for its electrical circuit. Another unique function of these perforated grilles attached to the discs is how they induce charge from the rotating discs onto the special collecting pads, or 'tasten' antennae keys (which are also perforated � so as to more readily pick up charge); for in a Wimshurst you had conductive brushes or rails of sharp points which actually touched the discs or were placed very close to them, but in the Methernitha the charge has to be made to traverse a parallel air-gap to the pads and for this purpose the metal gitter-grilles are so designed to create miniature eddy-currents of charged air which circulate in and out of the perforated metal's surface charges, and are more easily bounced out to the collecting pads. This process is categorised as VARIABLE CAPACITANCE electrostatic generation. Careful note needs to be made of how the Methernitha uses its basically Pidgeon setup with regard to its neutralising rods (that equalise and stabilise the opposite charges � see fig.2), and how charges are picked up from one area and accumulated at others, so that the polarities of charge are distributed correctly to specific areas on both discs [note 4]. And although there have been some fanciful claims, or misinformation, that it uses all sorts of radioactive materials to achieve its pulsed output I most strongly believe that the auxiliary electromagnetic circuit, that wraps itself around the rotating discs, portrays a simple electronic approach; afterall, who would use radium radioactive emission alongside leyden jar capacitors ! Indeed, the more you look into certain elements of its construction the more they point to three main eras of electronics development, the 1900's, the 1920's and the 1950/60's. The authentic Methernitha was designed and developed by purists who believed they had discovered a previously unknown electronic phenomenon, but they wanted to keep an integrity to the early pioneering days of the Pidgeon, Wimshurst and Holtz electrostatic machinery; they would not use such modern devices as transistors or IC chips (more's the pity) � but they do use some pretty uncommon electronic engineering in their circuit [note 5]. Obviously, the electronics are in two parts; one � the electrostatic generator and its particular technologies of how to direct what charge where, and two � the very unique auxiliary electromagnetic circuit of inductances, capacitances and rectification that mobilises that 'static' electricity. To understand how they convert static energy into an electromotive force you would do well to go back to the earliest years of radio. From the pages of spark radio you soon appreciate just how important oscillation circuits and their valve rectifiers were, and moreover, how difficult it proved to engineer them. For although radio transmitters and receivers from the 1900's used resonating circuits their oscillations were controlled by sparks between two contacts and, of course, they were relatively inefficient. Not until the 1920's did the first electric current oscillations become an observable, controlled, phenomenon when someone coupled a rectifier valve, a capacitor, and a resistor together [note 6]. The early 1920's also saw the best era of experimentation and invention for novel devices that turned static energy into useable electromagnetic energy; it was in a 1921 patent that we see a German physicist Hermann Plauson describe in great detail his methods to convert static power, not only from rotary influence machines but also from balloons collecting atmospheric electricity up in the sky; and by using thermionic rectifiers, leyden jar capacitors and inductor coils he proposed a free-energy network that was to power the whole of Germany [note 7] ! The thermionic rectifier valve heralded a new era for radio and high voltage physics, and as it was then subjected to such a broad array of experiments and modifications to improve its efficiency so it paved the way for all sorts of new avenues in electronics. Indeed, with such a technical catalogue of similarities with what we see in the available photographs of Testatika it can be assumed without doubt that the horizontal glass tube which sits on top of the Methernitha machines is exactly what a home-made vacuum thermionic rectifying valve would look like; with its internal anode mesh-plate, surrounded by a coiled copper grid, fed by a glowing (heated) cathode wire running horizontally across its centre and capped by two black end-pieces, which are too big and bulbous to be mere end-caps and must surely be black rubber vacuum seals to seal the glass tube and the input/output wires [note 8]. The precise components used to oscillate the primary oscillating circuit are, I believe, not to be seen in any of the available photographs, but there are various hints for their approximate whereabouts on the machine. Firstly, according to electronic design there should be a capacitor and coil configuration in close proximity to the rectifier. Well, from the picture "3KWREAR" can be seen the two long upright tubes which, according to those who have seen them first-hand, comprise a spirally turned aluminium strip (which indicates they are chokes [note 9]) inside a glass tube, inside the same sort of outer shielding that the big cans have (which indicates they are electrostatic shields), inside yet another glass tube, and are terminated at the top with a brass connecting rod which does a right-angled turn and passes into the side of the tower � but only two-thirds up the height of the tower. These two assemblies must form a connection to the rectifier, because the rectifier is at the top of the tower, so why don't these electrostatically sensitive tubes extend all the way up to it ? Again, from the photographs of the rear and front of the Methernithas there is a wire that comes out of the tower's side wall at about 4 inches above the upright's brass terminals and this wire then passes through a short black tube and on to the rectifier valve. This, of course, would happen on both sides of the tower, enabling a connection to both ends of the rectifier. But why have this 4 inch gap of connections at the top of the tower ? Something is placed inside the top of the tower in this intermediate space which is very necessary to the circuit, and I think it must be the location of the capacitor/inductor configuration to oscillate the circuit. This (fig.4) is how I would see the inside of the top of the towers [note 10]. I've seen some of the patented inventions that rotate discs - by using magnets (ie H.Rosenberg's permanent magnet excited rotational machine, US patent 3,411,027), and by utilising inscribed metalised discs (US patent 3,239,705 for instance), but there simply isn't enough room for these to be located in the Methernitha disc setup � also, you don't want to interfere with the ES fields that zip around the revolving discs: From the reports of those who have seen the small machines working it appears their discs were rotated by small DC electric motors after they were hand-started, some re-wound with thinner wire (to presumably increase their torque) and powered directly from the discs' generated electricity � but I have also seen how two discs can continue to rotate simply by careful placement of curved electrodes [note 11] which would act on the charges on the discs � like the 3kw Testatica Distatica generators. After reading through the many early accounts of electrostatic rotary machines, and some of the more recent ones, you can't help but be puzzled by the Methernitha's incredibly low rotational speed of just 60 rpm (and in the 1999 engineers report as low as�15 rpm !). Most other early experimenters boasted up to 3000 rpm, J.G.Trump in his work on high voltage generation in space [note 12] spun his rotary machine at 10,000 rpm (to produce 433 Watts at 24 KV no less). One reason for this low speed might be to do with the close proximity of the 50 lamellas (gitter-grilles) on the discs at their inner ends, they are very close together, I think too close. Air, normally an insulator, breaks down and conducts at around 25-35 KV (this figure has been fairly constant from day-one of electrostatic machine experiments right through to the present day � because air has a breakdown field strength of 3x106 volts/metre) and short-circuits the circuit. I feel that because this design of grilles is prone to short-circuiting at high voltages the Methernitha people have limited their rotational speed so as to ensure a low operating voltage � of what I'd guesstimate to be only 12 to 24KV. But, is this a waste of extra potential ? Not necessarily�For I don't think that the main power output comes solely from what the two contra-rotating discs supply. There is, I believe, a far more important power generator�the electron cascade generator, and the Methernitha has two of them, held inside the two horseshoe magnets, and providing the circuits to the magnets are made to oscillate at the right frequency at a high enough voltage then these metalised-perspex laminated blocks can enmass A MUCH LARGER AMOUNT OF ELECTRICITY THAN WHAT IS PUT INTO THEM. This, perhaps, is the previously unknown electronic phenomenon that the Methernitha group have so zealously been trying to protect against unscrupulous entrepreneurs. But I would say that this copious supply of free energy is already known to the world - it is not readily available - and its principles are not fully understood, as yet, but it is known about. As the descriptions say (on the Testatika website), between the horseshoe magnet legs are four blocks of transparent 'plexiglass' type material alternated with copper and aluminium plates (that may or may not be perforated), in the sequence c-p-a-c-p-a-c-p-a-c-p-a (also see fig.6). And according to the Linden Experiment, where Paul Baumann induces a resonance of about 80-140 MHz in a coiled horseshoe and then has an aluminium-insulator-copper block moved between the horseshoe legs, a voltage could be taken off the plates of the block which measured 700 volts (DC presumably) [note 13]. This incredible phenomenon has never been replicated by any 'outside researcher', and is said to be the basis by which the Methernitha machine could be understood how to work [the clue, possibly, to this principle may be variable-capacitance and dielectric-absorpsion]. But what, I hear you say, is an electron cascade... Well, it was only by chance, very recently, that I happened to listen to an audio tape by a Dr. Flanagan about crystal water; when I switched the tape over after the end of side one Dr. Flanagan then began talking about an electronic configuration that applied a high frequency, high voltage alternating field across an insulator � that created what he called an electron cascade effect � Yes, I thought, here is the answer to the Methernitha Machine. In view of the fact that it's designers have chosen to wind insulated wire (which may be bifilar [note 17]) around the horseshoe metal [note 18], it would be very possible to draw the extra electric current produced directly from the electron cascade blocks, with suitable connections that might lead downward into the wooden base (where it is believed that an alternate layering of perforated metal plates and insulating plates - making up a large high-voltage storage capacitor - is located). This power could then be discharged as a pulsed output of high wattage, especially if configured as a Pulse Forming Network [note 18]. The two big cans at the side, are probably not highly technical (see fig.7), once the fundamental formula has been decided upon all models of a testatika generator would follow a similar construction process. The written descriptions are a little contradictory but they seem to suggest a central input rod, or tube, connecting at the bottom of the cans to a stack of inter-linked pancake coils, that are wound secondary-outside primary-inside, fitted around a core of 6 hollow donut-ring magnets stacked in such a way with plastic spacers as to allow air gaps between them, and then finally the output of each can is a connection from the top coil of the secondaries of the pancake coils to a brass ring around the centre of the black plastic top lid � and from the photographs can be seen a large diameter wire or tube [note 19] connecting that polarity's output terminal to the top lid's brass ring via a brass screw terminal. I would suggest that the ring magnets (of anistropic ferrite perhaps) are gapped in this way to prevent the magnetic flux fields of the pancake primaries co-joining as one sprawling field, because it would be more advantageous, and safer, to have each separate pancake's magnetic flux cut it's own adjoining secondary coil, and divide the secondary output voltage into smaller amounts of potential, thus depending less on complicated insulating procedures that accompany high voltage single primary / single secondary transformers. 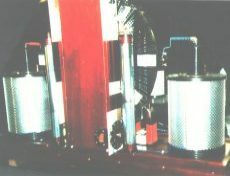 The use of aluminium mesh and solid copper sheeting is commonly used in electronic construction; the outer aluminium mesh cylinder would be used to shield stray electrostatic charges, and the solid copper cylinder is to shield the large amount of stray electromagnetic fields produced by the transforming process from high voltage/low current to lower voltage/higher current [note 20], obviously they don't want field contamination taking place between the sensitive electrostatic generator and the transformers. In the red wired can the transformer is wired to output negative, and the blue wired can's transformer is wired to output positive polarity. Special note should be made of a similar arrangement devised by Van de Graaff in his 'High Voltage Electromagnetic Charged-Particle Accelerator Apparatus Having an Insulating Magnetic Core' [note 21] with respect to magnetic reluctance gaps. Whilst it has been said that the clear perspex disc was designated the 'cloud' disc, and the (rear) dark disc the 'ground' disc I would think this relates to different types of acrylics or plastics that might become charged to different polarities, as in the triboelectric series, where frictional charging of different plastics - and then bringing them close together, might cause donation or acceptance from one to the other; I would think from the above that cloud represents a donator (positive charge) and that ground must mean an acceptor (negative charge). Has anyone tried the combination of a teflon disc (extremely negative charge) with a glass disc (highly positive charge) ? Or doped discs perhaps [note 22] ? 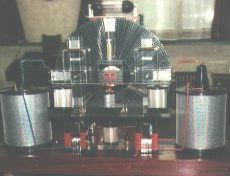 The Testatika design based on the Pidgeon/Wimshurst machine is of course only one type of electrostatic generator to build this system around. Since the early 1900s such power generators have come a long way in sophistication - and in power output - recently developed machines output 300,000 volts which can then be transformed and utilized [note 23]. For more information on electrostatic generators such as the Testatika e-mail Freeelectric.